Sample unlimited 4-ounce pours from 250+ beers! Beer hasn’t always been just malt, barley, water and yeast. In the past it often included ingredients brewers found around their breweries. Today’s brewer is rediscovering that heritage, and you can experience it at the Beers Made by Walking Festival, part of the World Beer Festival Raleigh. The program challenges brewers to take a walk through nature and spot something to make a beer with. Local and regional breweries will be showcasing the following beers, all made with ingredients or inspiration found from a nature walk. All four seasons are represented in this beer, which is Fullsteam Brewery’s Fearrington Spring brewed with ingredients that represent flora found near the banks of the Eno River. Virginia sweet grass represents the abundance of ferns and grasses that dominate the banks during the summer months; sassafrass represents the diversity of trees and their changing foliage during the fall; fir tips represent the pines and other evergreens; and local ginger represents the wild ginger that flowers along the banks in the spring. Fullsteam will also bring a saison brewed with Riverbend Appalachian Wheat and two very diverse microbial cultures. Old Sapp is a piney, dry-hopped cream ale that Southern Pines brewed with the Sandhills Area Land Trust (SALT). SALT works with private landowners to negotiate voluntary conservation agreements (Conservation Easements) on private property. Since its founding in 1991, SALT has permanently protected more than 11,800 acres of working farms, water supplies, endangered ecosystems, and urban open-space in our six-county service region. SALT recently commemorated the 468th birthday of the oldest longleaf pine in the world, as well as their own 25th anniversary. Bull City Ciderworks made good use of its Christmas tree this year — they threw it into a cider. Spruce Bringsteen is a semi-sweet, Christmas tree-infused cider with a citrus finish. This is one boss cider so let the Bull rock your silent night! Lips of Faith Golden Ale is a collaboration between New Belgium and Hof ten Dormaal, a “farm first brewery second” brewery in Belgium. For the beer, Colorado Malting Company hand malted sunflower seeds that grow near New Belgium and Hof ten Dormaal provided the spelt and Saaz hops. This beer is inspired by old and New Belgium. After going on a hike, one of Raleigh’s newest breweries was inspired to create an agave cream ale infused with ginger. 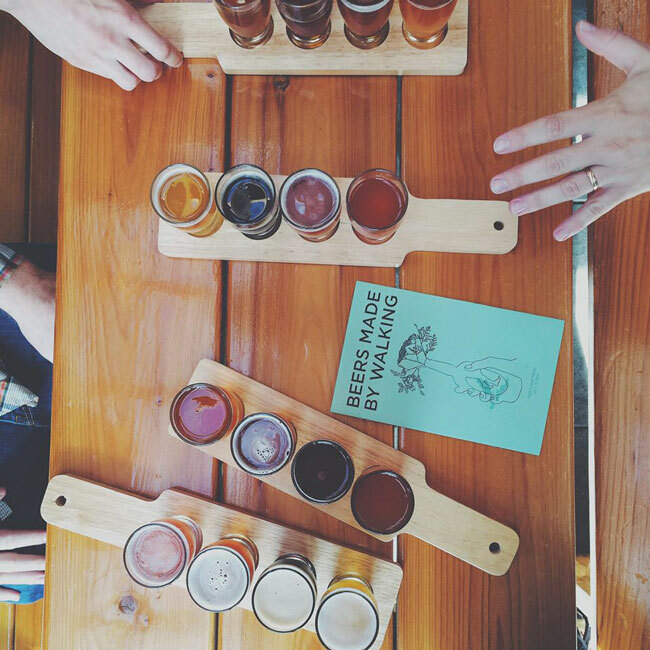 Learn more about Beers Made By Walking here, and join us on Saturday, April 2 to sample a wide variety of place-based beers.